What do you know about California wines? Most people probably think of it as a place for high-quality Cabernet Sauvignon and Chardonnay wines. But that is not all there is to California wines. There are many other wines available from California that are very enjoyable; some cool-climate wines like Pinot Noir and Sauvignon Blanc. To help prepare you for the California wineries attending the Vancouver International Wine Festival, I thought I’d give you a brief background on the major grape regions and some of the wines (outside of Cabernet Sauvignon and Chardonnay) you could expect. 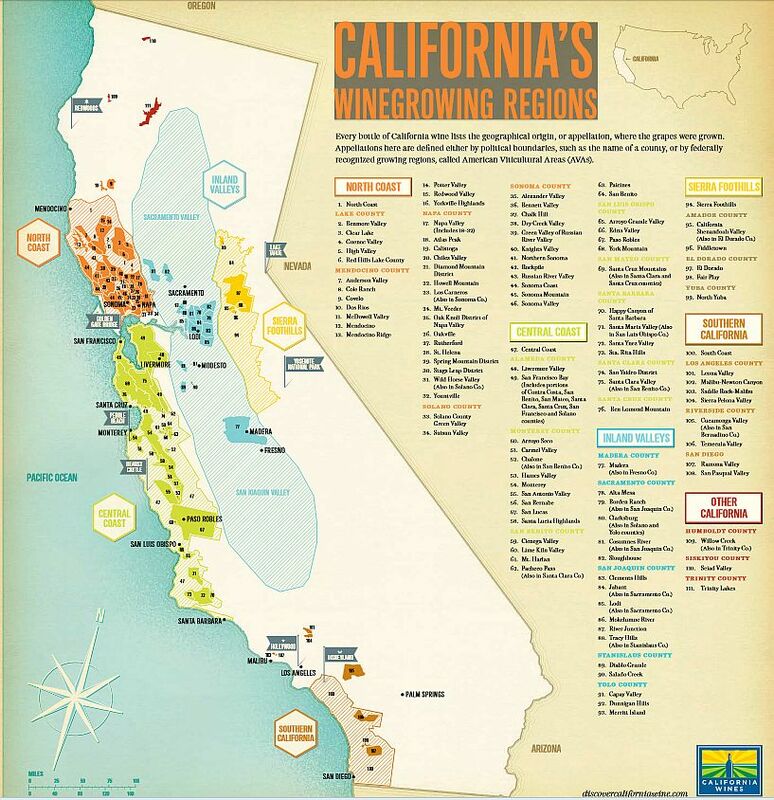 There are 5 major wine growing regions in California. You can view the above California wine region map interactively here. There are two key components to which grapes do best in which areas in California; nearness to the ocean and elevation above sea level. Both of these components help to control the temperature of each region, growing season length, and precipitation through rain or fog. Napa County, for example, is more inland than it’s neighbour Sonoma County and has higher temperatures and less precipitation. Cabernet Sauvignon thrives in Napa and produces full-bodied, ripe wines, while in Sonoma, the cool coastal fog visits the region daily, keeping the area cooler, and allowing for a long ripening season. The southern cooler end of Sonoma County is where you find the Russian River Valley and their well-regarded Pinot Noir wines. La Crema Winery in Sonoma does produce quality Pinot Noir. Although I have not yet tried Walt Wines‘ Pinot Noir from the Russian River Valley, it is on my list in the Festival Tasting Room. Moving further south, you come to the central coast, and an AVA I’d like to point out; the Santa Lucia Highlands. Most of this higher elevation area (up to 1200 ft asl) is planted with Pinot Noir grapes. The area is graced with cooler climate from elevation plus coastal breezes. 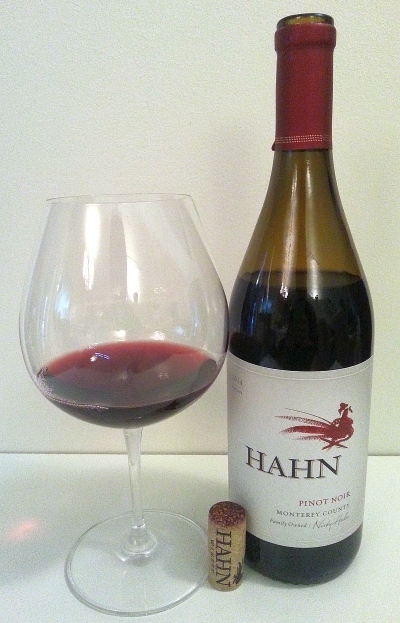 Hahn Family Wines produces excellent Pinot Noirs that I have tried in the past. I wrote about Hahn Family Wines in the past, tasting through several wines with winemaker Paul Clifton. You can read the article at this link. Moving slightly away from discussing coastal and elevation factors, other grapes that you may not realize grow well in California, that you may have a glass at the International Festival Tasting room are Sauvignon Blanc, Viognier, Pinot Gris, Gewürztraminer, Riesling, Zinfandel, Syrah, and Merlot (yes it is OK to drink Merlot). Chalk Hill Winery produces Sauvignon Blanc in the eastern edge of the Russian River Valley. St. Supéry Estate Vineyards and Winery is also a very good producer of Sauvignon Blanc. A variation on Sauvignon Blanc you may see is termed “Fume Blanc”, which is oaked Sauvignon Blanc. Robert Mondavi Winery in Napa was the pioneer in producing this wine style in California and is one of my recommended wines to try at the Festival. Grgich Hills Estate also produces a quality Fume Blanc. Rodney Strong Vineyards is a large winery located in Sonoma and has vineyards spanning the entire north-south length of the Valley. They produce Sauvignon Blanc, Pinot Noir, as well as Chardonnay and Cabernet Sauvignon. If you want a big, non-wimpy wine, and have not yet tried Zinfandel, visit the Ravenswood Winery table. I have also profiled a few of the California wineries attending the Vancouver International Wine Festival; you can read their stories and the wines they will be pouring. I look forward to the Festival and hope you have a chance to try California’s Pinot Noir, Sauvignon Blanc and much more. Enjoy.